Eating Blind – Eat Me. Drink Me. I have developed an irrational fear of flying. It’s impractical. Its source is unknown. But there it is. I have become the person that grips the edges of the seat and dons a horrified expression at a hint of turbulence. I am the one frantically slinging back seltzer and wishing I knew a good Hail Mary. I’m in a plane now, and I’m thinking back to the other times in life where I have been as paralyzed. Once, on the Appalachian Trail, caught in a raging lighting storm coming off the Blackstack Cliffs, shaking in lightning position, crouched low on one foot and singing the chorus to Amazing Grace over and over again, feeling hailstones hit my back. Once, flying through terrible winds, the plane plummeting and soaring like a whipped rag, with three failed landings. 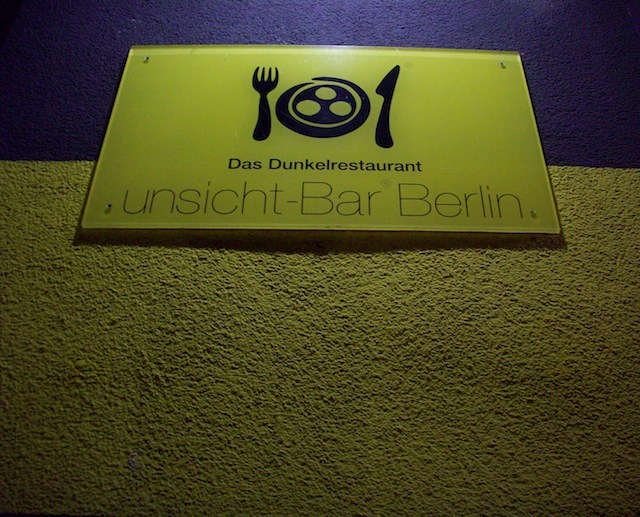 And once, eating at unsicht-Bar, the blind restaurant in Berlin. What all of these experiences have in common is the sort of fear that grips the bottom of your stomach and wriggles up through your chest, shortens your breath, makes you know a panic attack is just around the corner. And there is helplessness. You are not in control. unsicht-Bar is fashioned around the concept of blindness. Diners eat a four course meal in complete blackness, and the restaurant is staffed entirely by the blind. In the marble lobby, on plush lounge chairs surrounded by candlelight, you are given a menu whose dishes include such enigmatic delicacies as “The Frisian nobility is on fire and looking for acquaintanceship with the French underworld to practice love things.” It’s charming. We thought eating blind would be fun. After making our dinner choices, we were introduced to our waiter, Harald. Harald instructed us to grab on to the shoulders of the person standing in front of us. I watched my mother grab on to Harald and Elisabeth grab on to my mother. I took Elisabeth’s shoulders and felt the train whisk forward into the thick velvet drapes like some Wonderland-bound vessel. We wound around and when we stopped, we were in total darkness. You could stand in a dark room and close your eyes and it wouldn’t be as dark as this room. I waved a free hand in front of my face. Not even the impression of a hand sweeping past, fracturing light. We found ourselves whispering. Harald seated us one by one, instructing us not to move unless sanctioned to do so, and then he had us feel our plates, our forks, knives, soup spoons, napkins. He brought us wine. We felt our glasses. He brought us bread and we touched that too. And then we sat in that giant, dark room. I was massive and miniscule at the same time. Totally alone without my sight. I couldn’t see my hands. I couldn’t remember if they were there. I moved my fingers. I blinked and nothing changed. It felt futile, attempting to penetrate a black blankness. I reached for my mother sitting next to me and grabbed her hand and then we both grabbed for Elisabeth across the table. I breathed slowly, connected to two other people in the darkness, proof I wasn’t alone. Unobtrusively, the darkness opened up and I became aware of the tinkling of glasses, a woman’s laughter, the feeling of being in a vast space. 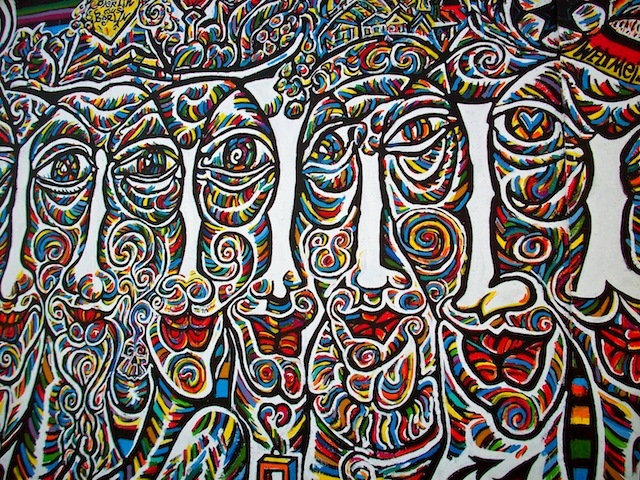 We talked to hear the sounds of each other’s voices, to locate ourselves. We loosened our shoulders, though our laughter was still tinged with nervousness. The food was delicious. Delicate. It had to be good – we couldn’t rely on our eyes to fool us into instilling taste into an artful cylinder of yams. And we had no idea what we’d ordered beyond fish, fowl, or vegetable. But my risotto was rich, the flounder fresh, and I ate bite after bite to figure out what that delicious vegetable was – sweet, slightly firm, a tuber? What was it, what was it…We exclaimed over our food. Oh! Look what I found! I thought I was done! Try this – where’s your hand? There was the moment when I reached into the bread basket for a second roll only to find it empty. I had two, said my mother. I had two, said Elisabeth. When you’re blind, no one leaves the last bread roll. You eat as much as you want and no one knows. I brought the empty fork to my mouth countless times, sometimes even upside down. Mom was eating with her hands. At one point, one of us (who shall remain unnamed) flashed the entire restaurant. Not even the others at the table had any idea. We moved through appetizer and salad, main course and dessert, by this time at uneasy peace with the dark. Once, I put my hands over my ears to see what it would have been like to be Helen Keller and I almost screamed just to control something. The thing about that darkness is, there is no relief. Deep breaths. The taste of fresh fruit. Finding a closed jar on the plate. Figuring out how to open it. Reaching inside and touching firm pudding. Making everyone open the jar to touch the pudding. Harald came to take our plates and offered to take us back into the light. We thought for a moment, silently communing. No, we’ll stay a little longer. There’s a word in German, seltsam, which describes the moment. Sitting in the dark was uncomfortable, but when would we ever know it again? Even the night afterwards was garish. Stucco gritted out in plain relief, brilliant colors, textured wooden window-sills, and space. So much space around us. I wanted to look everywhere at the same time. I wanted to stretch my arms out and know nothing was in my way. I was in control again. I barely remembered the fear, outside in the open air where I could see. I tried to recreate it – I closed my eyes, but everywhere was still the impression of light. Fear is a funny thing. Our mind remembers, I was afraid, but like pain, our body cannot spontaneously recreate the stomach’s clutch or the chest’s arching tightness. Today in my plane, the ride is relatively smooth, but just a few seconds of drop and rise, and how quickly fear blooms. I wish it weren’t so restrictive – that instead of paralysis, we can link in to the fear and find the seltsam, the unique experience of near death, and the joy of finding ourselves alive and unscathed afterwards. To taste the food with our eyes closed, so to speak. Because we can never feel truly safe unless we are scared every now and then. Really like this post. Well done, Lyz! Brilliant post, Lyz. I was unnerved in one segment then laughed in the next. Truly felt like I was there. You solid writer, you! This is so well-written! And the photograph at the bottom fits the sentiment in your post perfectly.